A child playing with wooden blocks. The definition of a block is a square piece of material that usually has flat surfaces that may be used for building things, as a child's toy, or as a work surface. An example of a block is a large piece of wood that is square in shape. 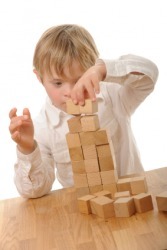 An example of a block is a child's four-sided toy that he can stack up or use to build things. An example of a block is a piece of wood or work surface on which you chop up food. A block is defined as an area of four streets that goes in a square, or a single street within an area of four streets, or the length of one of those streets. An example of a block is the four streets that go in a square around your house. An example of a block is the street your house is located on. An example of a block is the distance you need to walk to get from your street to the next street over. To block means to prevent something from happening or to make forward movement impossible. An example of block is when you cut the funding for a program, preventing it from going forward. An example of block is when you stand in a person's way so he cannot move forward. "block." YourDictionary, n.d. Web. 24 April 2019. <https://www.yourdictionary.com/Block>. Psychiatry a sudden interruption in speech or thought processes, resulting from deep emotional conflict, repression, etc. Fr bloquer < the n.
a. A solid piece of a hard substance, such as wood, having one or more flat sides. b. Such a piece used as a construction member or as a support. c. Such a piece upon which chopping or cutting is done: a butcher's block. d. Such a piece upon which persons are beheaded. e. One of a set of small wooden or plastic pieces, such as a cube, bar, or cylinder, used as a building toy. f. Printing A large amount of text. g. Sports A starting block. A stand from which articles are displayed and sold at an auction: Many priceless antiques went on the block. A mold or form on which an item is shaped or displayed: a hat block. A substance, such as wood or stone, that has been prepared for engraving. a. A pulley or a system of pulleys set in a casing. A set of like items, such as shares of stock, sold or handled as a unit. A group of four or more unseparated postage stamps forming a rectangle. Canadian A group of townships in an unsurveyed area. a. A usually rectangular section of a city or town bounded on each side by consecutive streets. b. A segment of a street bounded by consecutive cross streets and including its buildings and inhabitants. A large building divided into separate units, such as apartments. A length of railroad track controlled by signals. Something that obstructs; an obstacle: The disabled car formed a block in traffic. a. Sports An act of bodily obstruction, as of a player or the ball. b. Football An act of legally using one's body to obstruct or move a defensive player so that a player in possession of the ball may advance downfield, pass, or otherwise execute an offensive play. Medicine Interruption or obstruction of a physiological function: nerve block. Psychology A sudden cessation of speech or a thought process without an immediate observable cause, sometimes considered a consequence of repression. Also called mental block . Slang The human head: threatened to knock my block off. a. To stop or impede the passage of or movement through; obstruct: block traffic; mud that blocked the pipe. b. To prevent from happening, succeeding, or progressing: blocked every attempt to reform the rules. c. To shut out from view: a curtain blocking the stage. d. To stop the passage of (a motion or bill) in a legislative assembly. e. Sports To prevent or slow the movement of (an opponent) by using one's body, as by making a block in football. f. Sports To stop or deflect (a ball or puck) by using one's body. g. Medicine To interrupt or obstruct the functioning of (a physiological process), especially by the use of drugs. h. Psychology To fail to remember. To support, strengthen, or retain in place by means of a block. To shape, mold, or form with or on a block: block a hat. To indicate broadly without great detail; sketch. Often used with out: block out a plan of action; block out stage movements. To run (trains) on a block system. a. To obstruct the movement of an opponent by using one's body. b. To stop or deflect a ball or puck by using one's body. To suffer a mental block. Often used with on: I blocked on his name. Phrasal Verbs: block out To cover over so as to be illegible: block out sensitive information from a document before releasing it. To repress (a traumatic event, for example) from conscious memory. These verbs mean to cut off from sight: a tree that blocked the view; a road hidden by brush; mist that obscured the mountain peak; skyscrapers obstructing the sky; a fence that screens the alley; a face shrouded by a heavy veil. See Also Synonyms at hinder1, obstacle. A substantial, often approximately cuboid, piece of any substance. Anne Boleyn placed her head on the block and awaited her execution. A group of urban lots of property, several acres in extent, not crossed by public streets. I'm going for a walk around the block. A residential building consisting of flats. The distance from one street to another in a city that is built (approximately) to a grid pattern. The place you are looking for is two long blocks east and one short block north. I'll knock your block off. A wig block: a simplified head model upon which wigs are worn. A mould on which hats, bonnets, etc., are shaped. A set of sheets (of paper) joined together at one end. A block of 100 tickets. (computing) A logical data storage unit containing one or more physical sectors (see cluster). (computing) A region of code in a program that acts as a single unit, such as a function or loop. (cryptography) A fixed-length group of bits making up part of a message. (rigging) A case with one or more sheaves/pulleys, used with ropes to increase or redirect force, for example, as part of the rigging of a sailing ship. (chemistry) A portion of a macromolecule, comprising many units, that has at least one feature not present in adjacent portions. Something that prevents something from passing (see blockage). There's a block in the pipe that means the water can't get through. (sports) An action to interfere with the movement of an opposing player or of the object of play (ball, puck). (cricket) A shot played by holding the bat vertically in the path of the ball, so that it loses momentum and drops to the ground. (volleyball) A defensive play by one or more players meant to deflect a spiked ball back to the hitter’s court. (philately) A joined group of four (in some cases nine) postage stamps, forming a roughly square shape. A section of split logs used as fuel. (falconry) The perch on which a bird of prey is kept. (printing, dated) A piece of hard wood on which a stereotype or electrotype plate is mounted. A section of a railroad where the block system is used. To fill (something) so that it is not possible to pass. To prevent (something or someone) from passing. You're blocking the road – I can't get through. To prevent (something from happening or someone from doing something). His plan to take over the business was blocked by the boss. (sports) To impede an opponent. He blocked the basketball player's shot. The offensive linemen tried to block the blitz. (theater) To specify the positions and movements of the actors. It was very difficult to block this scene convincingly. (cricket) To hit with a block. (intransitive, cricket) To play a block shot. To disable communication via telephone, instant messaging, etc., with an undesirable someone. I tried to send you a message, but you've blocked me! When the condition expression is false, the thread blocks on the condition variable. To stretch or mould (a knitted item, a hat, etc.) into the desired shape. I blocked the mittens by wetting them and pinning them to a shaped piece of cardboard. From Middle English blok (“log, stump, solid piece”), from Old French bloc (“log, block”), from Middle Dutch blok (“treetrunk”), from Old Saxon *blok (“log”), from Proto-Germanic *blukką (“beam, log”), from Proto-Indo-European *bhulg'-, from *bhelg'- (“thick plank, beam, pile, prop”). Cognate with Old High German bloh, bloc (German Block, “block”), Old English bolca (“gangway of a ship, plank”), Old Norse bǫlkr (Norwegian bolk, “divider, partition”). More at balk. A group of bits, often comprising an integral number of bytes, encoded, processed, transmitted, or otherwise treated as a unit. See also bit, byte, and encode. Sudden cessation of speech or a thought process without an immediate observable cause, sometimes considered a consequence of repression; mental block. To interrupt or obstruct the functioning of a physiological process, especially by the use of drugs. It fled like a wounded animal and it was impossible to block its path. Yes. I'm sorry so many buildings are gone but that one block is enough. Whatever he was going through, he was doing his best to block her. Dean looked over his shoulder, expecting to see a local postmark but read, written in block letters, Rollins, Kansas.